Moog Sub 37 101 - Master the Moog. How many LFOs are found on the Sub 37? A modulation bus can only modulate a single parameter on the synth. True or false? With the cutoff filter turned to its most clockwise point, will the high frequencies be removed or allowed to stay in your sound signal? 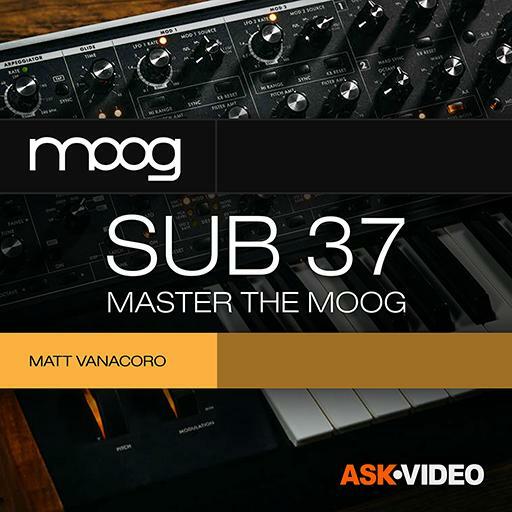 Where are the modulation controls located on the Sub 37? The arpeggiator can be set to a tempo using the knob or slaved to an incoming MIDI clock. True or false? Patches which have the arpeggiator enabled from the factory cannot have the arpeggiator removed. True or false? Why can you only play 2 notes at a time in duo mode? When enabling oscillator sync, the sound you are designing will often have more of an ‘edge’ to it and really stand out in a mix. True or false? The filter envelope is physically similar to the amp envelope but is just applied to a different element of the synth. True or false? The headphone volume and main volume are linked. True or false? When choosing a bank, you must first press the bank button before choosing a corresponding number. True or false? The CV inputs labeled on the side of the Sub 37 are fixed and cannot be changed to modulate other parameters. True or false? Glide mode can be adjusted down to zero, but cannot be disabled. True or false? To save a preset, should you quickly press the save button or hold it? What element must the cursor be over when you want to keep the browser ‘locked’ to a sound category? Which filter slope is the most ‘aggressive’ and has the steepest decline? Which oscillator is sync’d to which oscillator when the sync button is pressed? You can compare a preset to its stored state, as well as to other stored presets. True or false? The default preset has what elements enabled in its natural state? What element in the mixer will give you another sound source one octave below oscillator one? What element of subtractive synthesis typically removes the unwanted frequencies?